First it was the Burton’s foundation stones, then the cockerels and now two heads above Oxfam on Market St. Have I been walking around Lichfield with my eyes closed for the last 7 years? 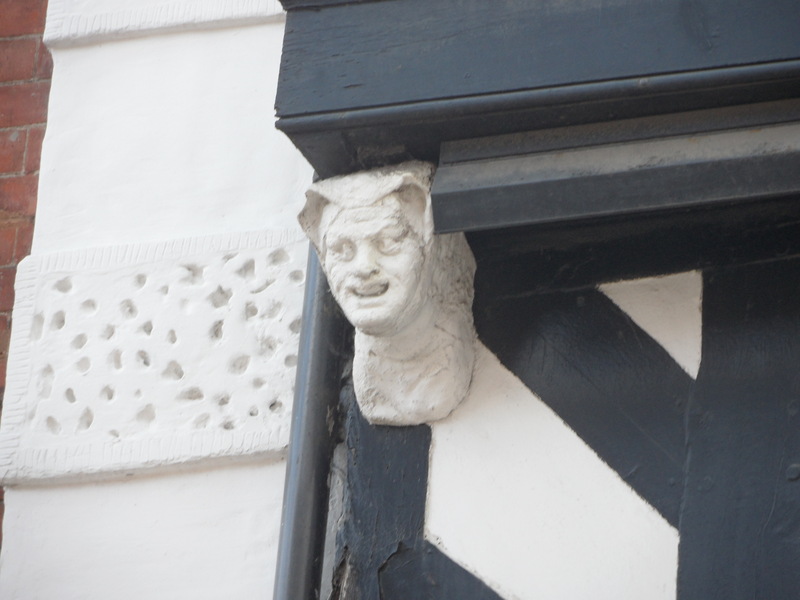 I have discovered from the listed building description that the correct term is corbel heads. I’ve taken a close up of each of them. Information on these heads is pretty thin on the ground. The listed building description tells us that the building is late C16th, does this mean that the heads date back to this period too? I’m not quite sure whether the one on the right is supposed to be sad or asleep (or as someone on twitter suggested ‘three sheets to the wind’). Do they represent some sort of old joke or story or moral? The building was a pub from at least 1793 (first record) until it closed in 1962. There is a photo of The Castle on the Staffs Pastrack website, taken in the early part of the C20th. One peculiar thing, although this might just be me, is that the head on the right doesn’t look the same. I think on the old photo it looks like he has a beard but he looks like he’s had a shave since! On the subject of the old photo, what is that circular object between the pub windows, beneath the lamp? The thing that looks a bit like an anachronistic satellite dish. It’s just occured to me as I’m typing this that I could pop in & ask in the Oxfam shop if anyone knows anything. Of course, if there are any corbel head experts out there, please let me know your thoughts! 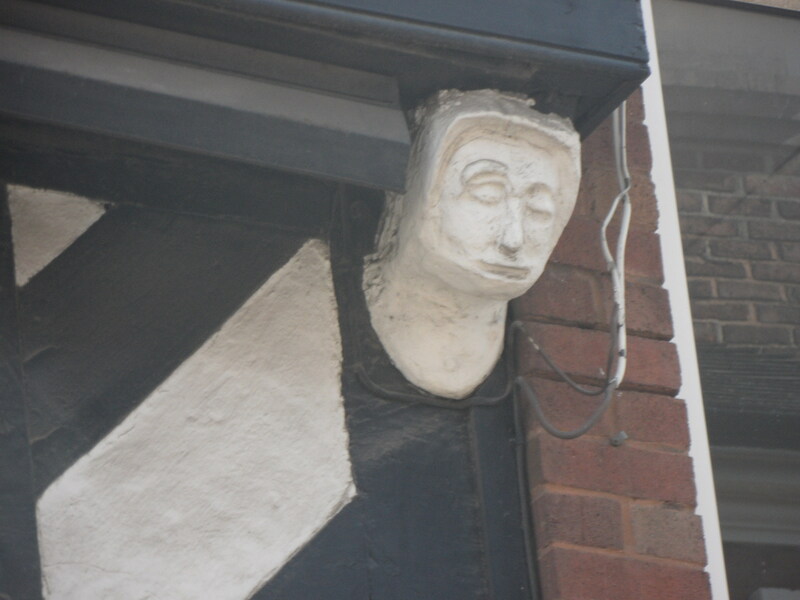 This entry was posted in architecture, Lichfield, market st, pub, shop and tagged architecture, corbel heads, Lichfield, market st, old pubs, shops by Kate. Bookmark the permalink. front I like most in Lichfield is now the Subway food outlet it is fantastic. Thanks Pat, I think you could be right. The ‘Subway’ shop front is lovely, with that big lantern outside too. There’s the bag shop front a little further up too. Wonder what they were originally, might be able to find out with help of trade directories! house I must find out more about him. Subway was a chemists, originally, and for many years thereafter. Re the bag shop – that was Mercers, who were saddle makers and harness makers. If you go to the St Mary’s centre and look at the photos on the corridor wall, you’ll see a picture of it. I know because I did just that today! By the way, terrible memory, I can’t think what was at Subway shop immediately before Subway, can you remember? I think it was a ladies underwear and nightwear shop . p.s not that I spent much time looking in the window . Thanks, both for the answer & making me laugh! Have a look at this website it is outstanding .revolutionary players.org.uk . I found out last night that the current owners of the bag shop are related to the Mercers through marriage. Mercers actually went bust, I was told. Re Linfords, really sad, and outstanding creditors, in particular a Saudi Prince on a huge home down south, helped push them over the edge. The cottage at the bottom of Quonians is worth an article if ever you get time. As far as I understand Linfords took over Bridgemans? There is a great book on Bridgemans by Owen Kyte called Annals of a Century. I was thinking about doing something on them before the events of this week, as I’d been finding out a bit about them via Vickie Sutton’s family. The Bridgeman’s buildings on Quonians Lane are incredible and I assumed you meant these at first but actually there is also a pair of cottages with round plaster image of the Virgin & Child too, did you mean these? Either way they are all fascinating buildings! I did mean the cottages yes Kate (sorry it’s taken so long to reply, been busy doing “things” – i.e. I dunno what!). I always wanted this to be a collaborative thing, with as much participation as possible and so I am really, really pleased that you’d like to contribute 🙂 I think that it will be fantastic to hear someone else’s take on this great city of ours. Go for it! You can send me an email or there might be a way to set you up as an author directly, I’ll have to check…technical’s not my thing! Looking forward to being the one leaving the comments! PS It’s amazing how much time “things” take isn’t it?! Brilliant thanks. I’m so busy at the moment too, must work on a post of my own! This is a great area of town 2nd only to Dam St. It was the Medieval town. Market street was originally known as Robe then Sadler St (lots of leather working). 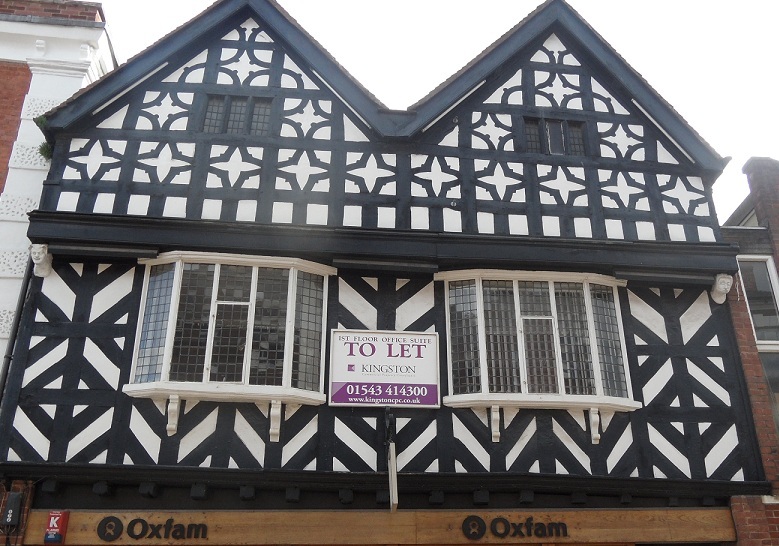 Oxfam was The Castle Inn at one point and the modern oak was insisted upon by the planners. Subway was CHARRINGTONS Chemists originally before being passed on. MERCERS was opposite Samuals (which was a shop with the the Angel Inn next door). Wonderful Georgian bow fronted windows..pity Subway have painted them BLACK!! Market St was the place to live from the C17th onwards hense the ornate frontages, and the gardens ran into what is the car park next to Minster Pool. You mention Richard Greene but also Elias ASHMOLE herald to Charles the 2nd was born here around the corner in Breadmarket St (2 doors from Dr Johnsons birth place) and later founded the ASHMOLEIAN museum,and gave plate to the City. B&M was Woolworths (rebuilt several times) and the clothes shop next door is a modern replacement for the old Midland Bank (later HSBC which moved to its present place at the Market Square). Opposite, The Scales was both The Scales (with garge in the 20’s) and Commercial Hotel.. and Burtons next door. Caution however at the other end of the Market in Conduit St ….Currys as it was (can’t think what it is now..a cheapo toiletries shop???) has a Tudor frontage…its mock and and was the Malt Shovel Hotel… nice Victorian building. Next door is HALLS Butchers (is that the chaepo toiletries place?? now??) and I remember old Henry Hall very well. Towards the Earl of Lichfield pub , McDonalds was Central Garage upto the lates 70’s. boots I think was 1920’s mock (not sure). Funnily enough I know someone who is working at the Ashmolean. We don’t seem to make too much of a big deal out of him here. I’d say he’s probably fourth billing below Johnson, Darwin and Garric? Wonder why?